HOW MUCH PROTEIN IS IN FISH? We all know that meat and poultry have a lot of protein. But what about fish? If you, like me, are looking for different options to fill your protein requirements, it’s time to take a closer look at fish. Fish is loaded with vitamins and minerals. Each type of fish provides slightly different nutritional value. Some fish may provide more Vitamin B6, for example, while another type of fish may provide more Vitamin E. Below are some of the vitamins and minerals commonly found in fish. Fish also provides a lean source of omega-3 fatty acids. Omega-3 fatty acids are good fats that your body needs but can’t make itself. Two crucial omega-3s are EPA (eicosapentaenoic acid) and DHA (docosahexaenoic acid). They are primarily found in certain fatty, cold-water fish such as mackerel, sardines, salmon, herring, halibut, trout, anchovies, and tuna. ALA (alpha-linolenic acid), the third omega-3, is found in certain plants. Research shows that omega-3 fatty acids benefit heart health. Omega-3s help to lower triglyceride levels. High levels of triglycerides are associated with coronary artery disease and metabolic syndrome. One in four women in the United States dies from heart disease every year. Research shows that omega-3 fatty acids are particularly beneficial for post-menopausal women. Omega-3s can help slow, and potentially reverse, coronary atherosclerosis in women with heart disease. Omega 3-s also benefit your brain. They help support mood and memory as you age. So how does the protein in fish stack up to the protein in beef, pork, chicken and turkey? A 3 oz. serving of skinless chicken or roasted turkey has about 25 grams of protein. The same serving of beef has about 26 grams. Pork has about 22, while ham has about 14. Many fish and other seafood contain over 20 grams of protein per 3 oz. serving. I consider 3 oz. to be a conservative serving. Many people would consider 4-5 oz. (or more) as a serving. Depending on your serving size, one serving of fish may provide over 1/3 of your recommended protein for the day. 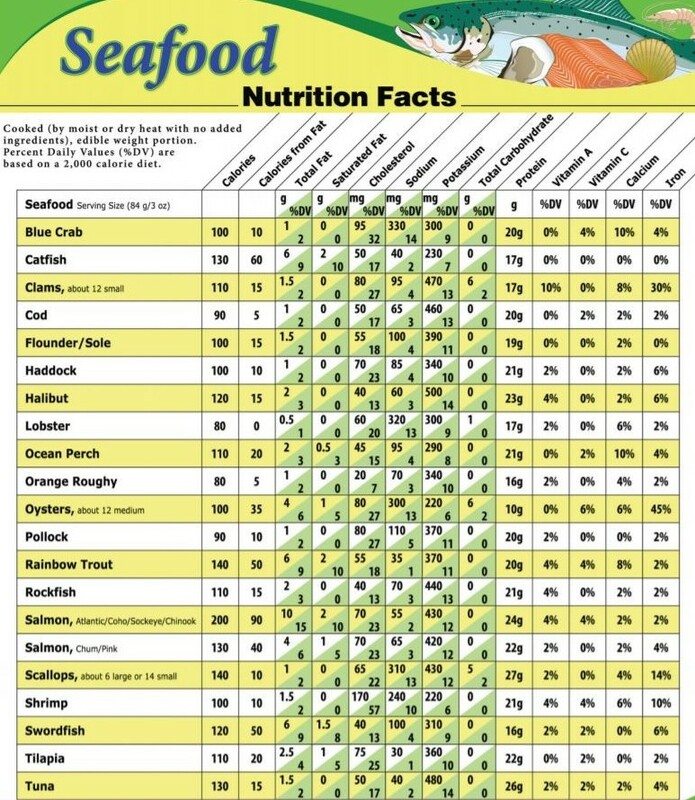 The chart below from the U.S. Food and Drug Administration shows the protein, fat, calories and other nutritional information for 21 fish and seafood varieties. The American Heart Association recommends eating fish, particularly those high in omega-3s, at least two times a week. Fish provides complete protein with little to no saturated fat. Having varied sources of protein from fish and other seafood–with a mix of both fatty and lean fish is recommended for optimal nutrition. Many people are familiar with only a limited variety of fish. Some people have only eaten a few similar types of fish and conclude all fish are about the same. Other people have tried fish a few times and are convinced they do not like it. As with many foods, different varieties have different textures and tastes. There is very fishy fish, such as Anchovies and very mild fish, like Cod. There is flaky fish, such as Sea Bass and denser fish, like Mahi Mahi. There is raw fish (Sushi) and canned fish (Tuna) and everything in between. Plus, there is a variety of seafood–Scallops, Shrimp, Clams… Of course how the fish and seafood is prepared is a huge factor in whether someone likes it or not. Personally, I need to have any fish or seafood to be well cooked. I would rather have overcooked Halibit than undercooked Swordfish. For me, it all has to do with texture. Other people prefer Sashimi and seared Ahi. There are so many different types of fish to try and so many different ways to prepare it, there is bound to be some varieties that appeal to almost everyone. Below is a list of fish high in Omega-3s and a list of lean fish and seafood. Is fish a good, healthy source of protein? Yes. But it isn’t perfect. Traces of mercury is present in pretty much all fish and shellfish. These trace amounts are not usually a concern for most people. However, some fish contain more mercury than others. Larger amounts of mercury is generally found in predatory and older fish. Shark, swordfish, king mackerel and tilefish are reported to contain the most mercury and should be eaten in moderation. The highest concentration of mercury is found in the skin and outer fatty layer of the fish. Removing these portions and eating a wide variety of fish can help reduce your risk of consuming excess mercury. Children and pregnant women should avoid eating these four fish. As you can see, most fish has 20 grams or more of protein per 3 oz. serving. If you are looking to expand your sources of healthy protein or looking to add more protein to your diet, I encourage you to try several varieties of fish. Fish supplies a multitude of nutrients, in addition to protein, and provides many benefits to your health. Thank you for this informative article. Fish is essential for our bodies and minds. I eat fish very regularly. I know that it is a great source of Omega-3 fatty acids and a good source of protein, but I didn’t realize all the other benefits it has! Thanks for stopping by and leaving a comment, Rob! Yes, fish has many health benefits besides being a great source of healthy protein. I very much appreciate my coming around your post today. I have learnt a lot concerning fish and different types of fish. I have learnt today that there is a fish Called King mackerel which contains more mercury than the other while eating of mackerel is one of my favourites. I will be careful this time how much I eat fish due to Mercury. You mentioned that children and pregnant women should avoid some fish due to its Mercury contents, is there any other reason for pregnant women to avoid eating some fish not limited to the ones you mentioned? Thanks for your comment and question, Bibian. In general, eating fish (fully cooked) low in mercury is considered safe for children and pregnant women. However, it is best to check with your doctor for a personalized recommendations. As I mentioned, you can greatly reduce any mercury present in fish by removing the skin and fatty area under the skin. Great post! I honestly never thought of protein when eating fish. I also just thought of omega 3 fatty acids. Anyways, I love mostly all fish. I love cooked fish and really love sashimi. I craved sashimi when I was pregnant, but of course couldn’t have it. The problem is that I am the only one in my household that really loves to eat it. What would you consider a milder fish taste that I can introduce to my children? In answer to your question, there are many mild tasting fish that your children will probably like (or at least eat)! Have your children ever had fish sticks? The fish used in fishsticks is very mild–you mostly taste the breading. I’m not recommending fish sticks, but Cod and Pollock are typically used in fish sticks. You could try one of those. If you think they won’t like fish by itself, you may want to try mixing it with something they do like–or even putting a little ketsup on it if they like that. I definitely appreciate this post, because it gives me more motivation to eat seafoods, and in particular, SCALLOPS! Who knew they’d have the most protein? They’re definitely among my favorite things to eat of all time, and we all know we lose weight when eating more protein and less of everything else…so I my have some more fish in my future. I’m glad I gave you more reasons to eat scallops! They are one of my favorites as well! Fish and seafood has more protein than many people think. I have certainly learned a great deal about the benefits of eating fish. This is an excellent resource for many people, as it is for me. I am very lazy about my diet now days and I see some of the things I am lacking in my diet, Magnesium for instance, can be found in fish. It’s also great to know that fish provides a healthy source of protein, even though it’s not perfect. The fact that mercury can be found in fish is something I became aware of several years ago. This is one of the reasons I stopped eating fish for quite some time. But then, when I think about insecticides used in growing vegetables, it seems that we cannot be protected against some additions to our food. So I believe that at least two servings of fish per week would be of greater benefit than going without. Thank you. I will revisit this post and take note of the different kinds of fish I consider of benefit in my diet. Thank you for your kind comment, Valerie. Fish does provide good nutrition on many levels–not just protein. Mercury is primarily a concern with some fish oil supplements. The large predator fish typically contain the most mercury. Removing the skin and the fat under the skin of these fish will greatly lessen the amount of mercury consumed. Most fish are very safe and healthy to eat.